Wearable length of approximately 19″. The centerpiece measures 4″ tall x 4 3/4″ wide at its widest point. 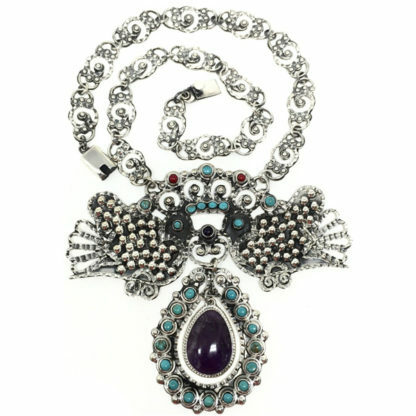 This stunning sterling 925 Taxco vintage inspired necklace showcases a detailed display of deco silver beaded and scroll work in a dove / lovebird motif — all of which has been infused with colorful amethyst, turquoise and coral inlays! The silver work has been punctuated by a niello darkened finish, enhancing the detailed texture and depth of this piece.